I am going to begin this Costco Food Finds by taking a moment to look over the past year. 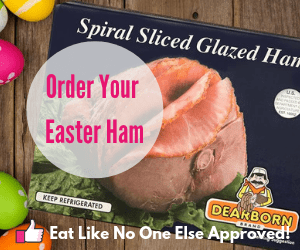 It was one year ago I began this epic (or not so epic) journey of searching the shelves of Costco to find the readers of this blog the very best Costco has to offer. 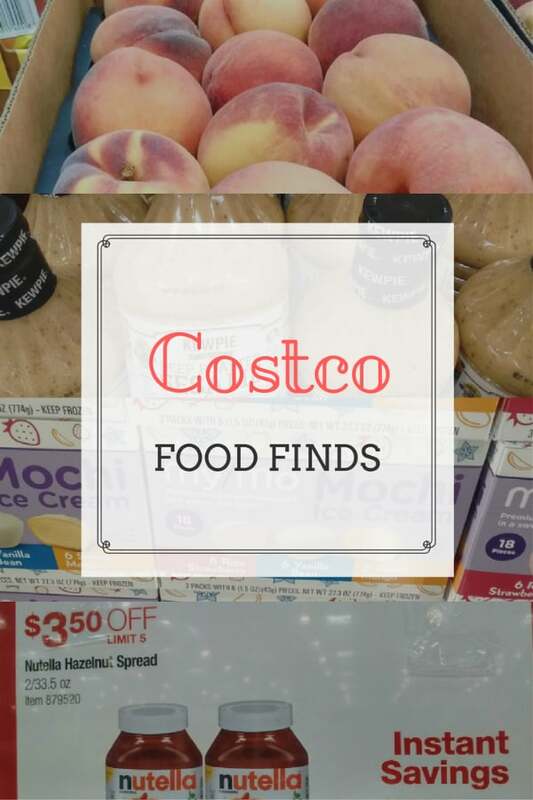 Here is a link to the very first Costco Food Finds post – Costco Food Finds for August 2016. Now here is a few things I have learned along the way. 1. A lot of items at Costco come and go. 2. My email list subscribers ? love these posts. So much that if I stop doing them there may or may not be a riot. I don’t want to risk finding out. 3. It is easier to take a pen and paper to write down prices then scrolling through my phone looking for pictures of them. 5. I am going to repeat myself and that’s ok. 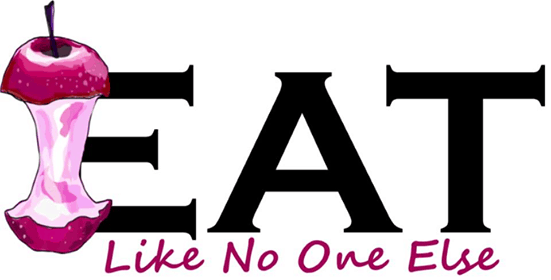 I am doing it for emphasize not because I ran out of ideas (thinking to myself – I think they bought that). Alright enough looking back. 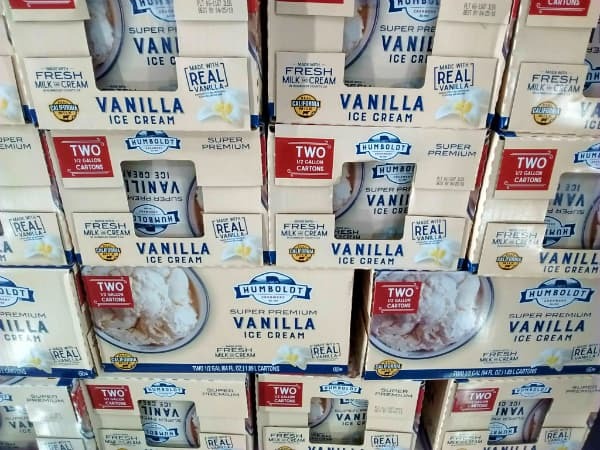 Let’s look forward to this month’s Costco Food Finds. We will talk about new crops, seasons ending, peach recipes, sheep milk and excuses to buy ice cream. Please note the number listed with the product is Costco’s product number. This will help you to identify you are getting the exact product I am talking about. Bartlett pears are ripe when they turn yellow and there is slight give right around the stem. Don’t wait until they are soft all around or they will be rotten on the inside. 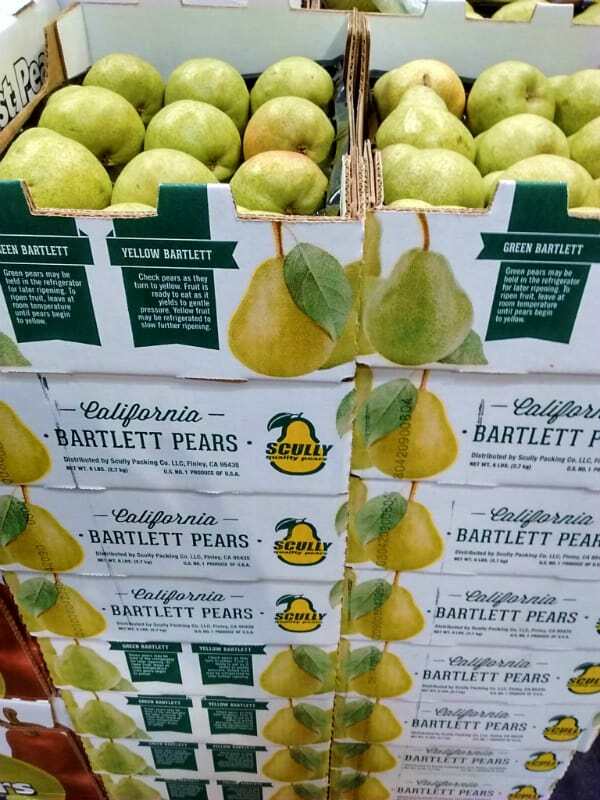 The very first domestic grown pears of the season are Bartletts from Calfornia. 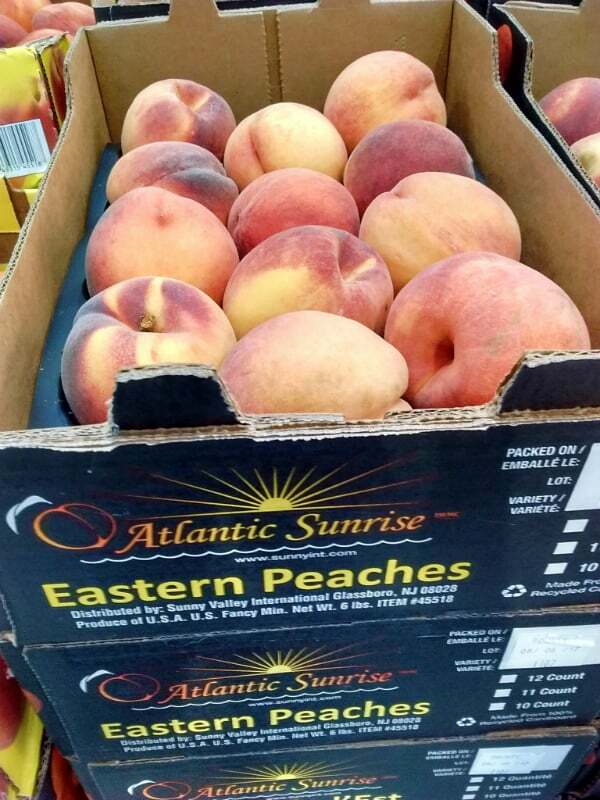 These Eastern peaches are from New Jersey.
? Peach season is coming to an end soon. If your store offers them look for the New Jersey grown peaches. I find that as we get later in the season, most California peaches found in teh grocery stores are mealy and do not have a good texture at all. I avoid them and try to buy locally. New Jersey is a good option. 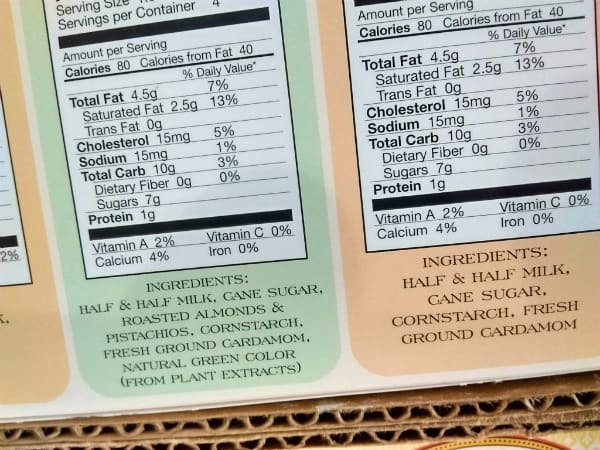 Check the side of the box to see what variety you are getting so you know for the future (there is that repeating myself thing I was talking about). August is a great month for pluots. The most common one is called Dapple Dandy or Dinosaur Egg. 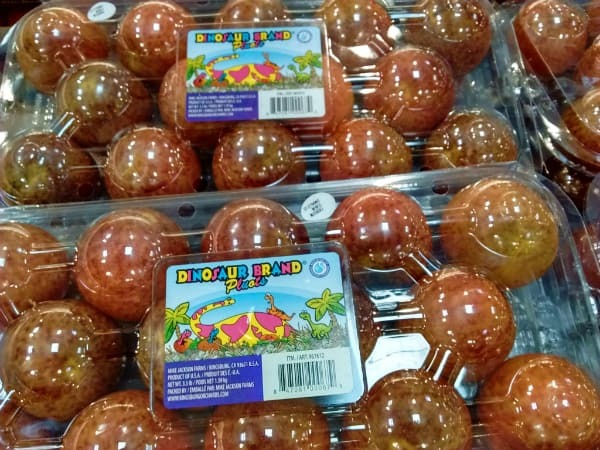 It is pink inside and out with a dapply looking apperance or kind of like what cartoons have taught us that dinosaur eggs look. they are sweet and your kid will love them. 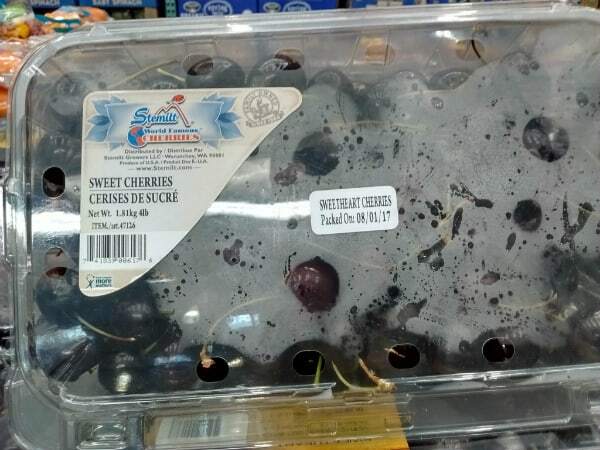 Label may say plums but these are actually plouts – the Red Phoenix variety. These pluots were actually in plum clamshells. 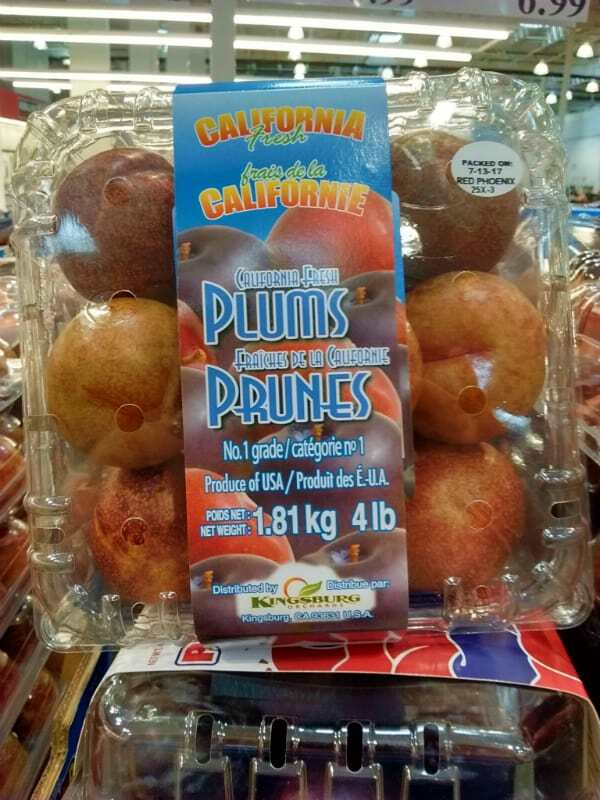 I have seen this before, but if you look up the actual variety name (which is listed on a sticker on the front of the package) this one is technically a pluot. And it’s cheaper than the dinosaur one. Red Phoenix is darker in appearance but just as tasty. Check your red plum display and see if any of these pluots are among them. Cherry season is almost to a close. This is your last month to get them. I recommend looking for the Stemilt logo on the packages. They are one of the best growers out of Washington and their cherries seem to be more crisp than any other cherries this time of year. 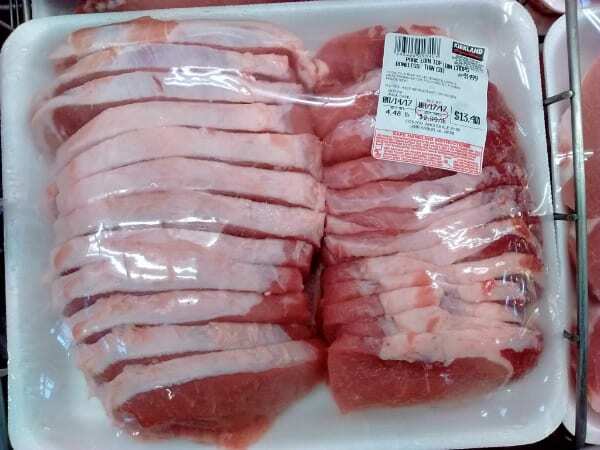 Thinly sliced pork cutlet are great for quickly cooking on the grill. Get the thin cut versions of these pork chops and try out ? my recipe for Peach Glazed Pork. My recipe calls for hatch chilies which I did not see any at Costco. 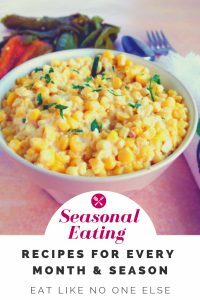 You could up the flavor with some red pepper flakes and/or smoked paprika which you can find in the grocery aisle. A Spanish sheep’s milk cheese. This cheese is very popular in Spain and it should be in your house as well. It is a sheep’s milk cheese that is aged 6 months. Manchego has a pleasant sharpness to it that is not overbearing. I love it with crackers. Sheep milk are generally more expensive than cow’s milk cheese. 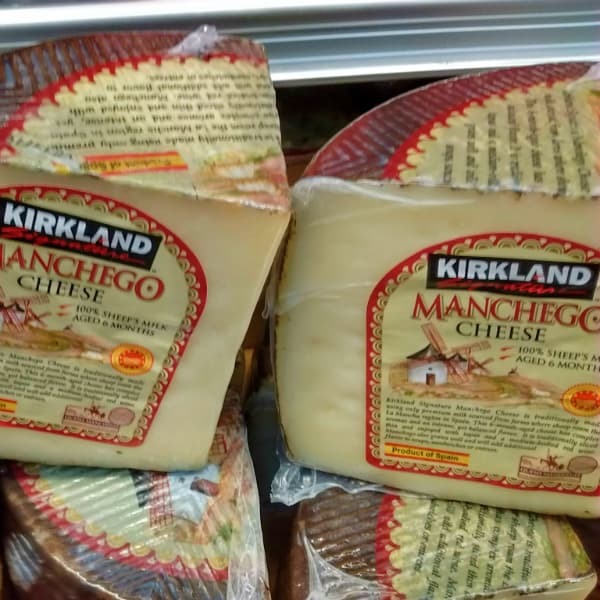 The Costco price is a good for Manchego. This month is the last month it will be hot in a lot of places in the country. A great excuse to indulge in some frozen treats. Check out these 3 great options. Creamy vanilla ice cream waiting to be paired up with summer’s best fruit. 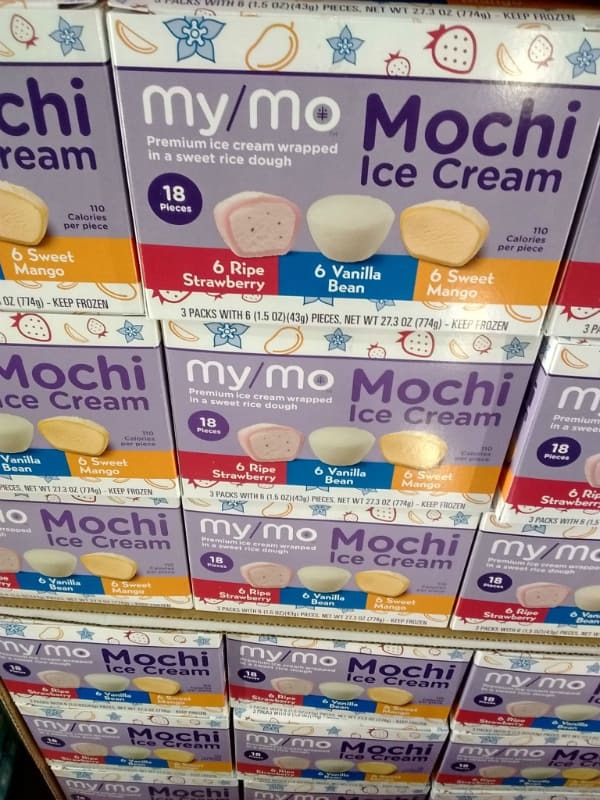 Costco has gotten themselves into the Mochi game. This Japanese ice cream is surrounded in a sweet rice dough. Mochi ice cream is all the rage right now. Headlines were made with Whole Foods opened up a self service mochi bar. It was just a matter of time before Costco got in on the act. 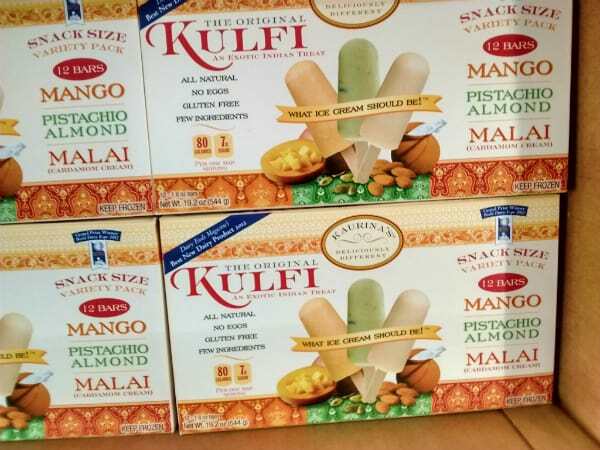 These ice cream bars are made with half and half along with other pronounceable ingredients. This dressing and marinade has a truly deep roasted sesame flavor. I typically make my own salad dressings (like this blue cheese one). There was a day where needed some to go with salad I had packed. I decided to give this one a try. I do not know if I can do a better job at home making this sesame dressing – it is that good. Full of flavor. 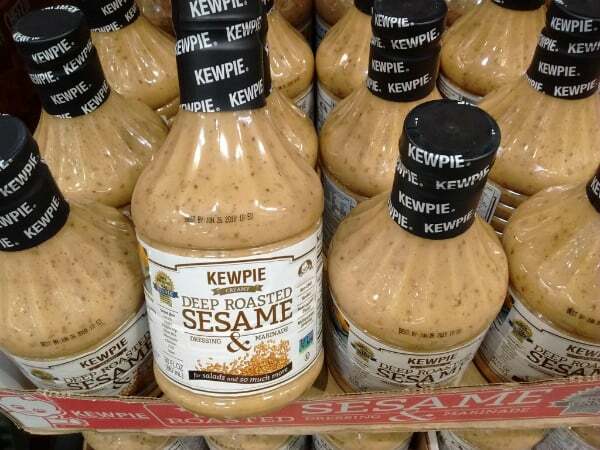 If you love sesame, you gotta get this stuff. And get is soon as the sign had the dreaded asterisk on it which means when they gone, Costco won’t be having more. The dressing could work as a marinade for chicken as well – would be great on a wrap. Speaking of salad, here is an idea for a salad topper. 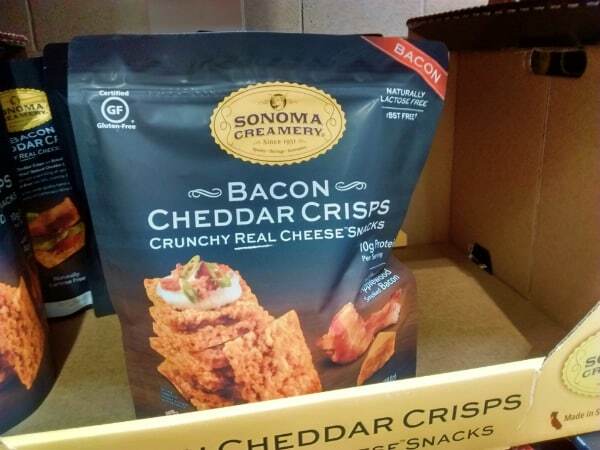 – bacon cheddar crisps. You get cheese and crunch at the same time. These differ from crackers as they are mostly cheese. Adding applewood smoked bacon just makes it even better. 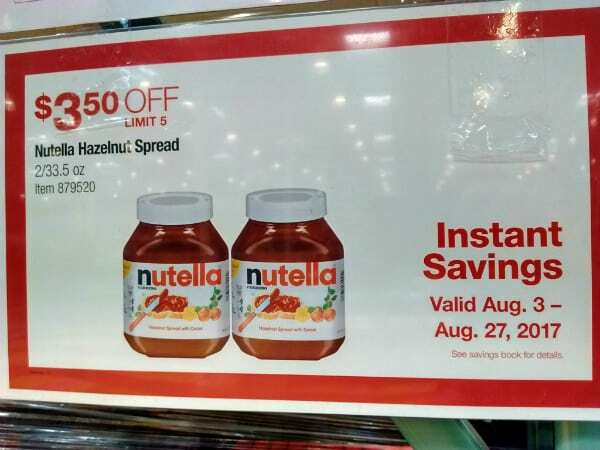 Come in by August 27th to get a great deal on Nutella. My cute 6 year old daughter refers to pronounces it as “Nut-nella”. It’s too cute to correct. She is going to be happy with the 2 huge jars I brought home for this Costco trip. There is currently a deal running through August for $3.50 off 2 jars making your total $8.49. That;s a price you just can’t beat. We like to spread it on soft flour tortillas and roll them up for a easy desert. These posts really are my favorite! I make my grocery list after I read your recommendations every time! Thanks for the kind words. I am glad you find them to be so helpful.